As manufacturers of printed circuit boards, or PCBs, know, ensuring quality throughout the manufacturing process is critical and requires careful attention at all phases. Adhering to standards from the trade association IPC can help. IPC is the trade association for the electronic interconnection industry. It provides standards for the assembly and protection of electronic equipment, as well as training, market research and public policy advocacy. IPC is a member-driven organization and has more than 4,800 member companies around the world. Its members include companies in all aspects of the global electronics industry, including designers, suppliers, board manufacturers, assembly companies and original equipment manufacturers. The organization got its start in 1957 as the Institute for Printed Circuits. It later changed its name to the Institute for Interconnecting and Packaging Electronic Circuits due to the expansion to packaging and electronic assemblies from bare boards. In 1999, it adopted the name IPC, with the tagline Association Connecting Electronics Industries. IPC has its headquarters in Bannockburn, Ill., and has other offices around the United States and the world, including in India, China, Sweden and Russia. The American National Standards Institute has accredited IPC as a standard-developing organization. What are IPC standards? They are the most widely recognized acceptability codes in the electronics industry. The organization publishes standards for nearly every phase of the electronic product development cycle, including design, purchasing, assembly, packaging and more. IPC currently has more than 300 active standards and more than 1,000 standards in its resource library. Committees of volunteers from across the electronics industry draft, edit and vote on IPC standards. More than 3,000 industry professionals across the globe participate in this process. Committees can include people from around the world, as members can participate via in-person meetings, teleconference and email. The association provides validation services programs, including a standards gap analysis that helps organizations address manufacturing issues and determine what they need to do to reach compliance with standards. It maintains a qualified manufacturers list and qualified products to help you determine if a product complies with IPC standards. There are more than 110 IPC-licensed training centers around the world. The organization also offers online and multimedia educational and training resources. It hosts educational events, as well as technical and management conferences including IPC APEX EXPO, which is the largest electronics manufacturing industry exhibition in North America, and APEX South China. Additionally, the organization conducts market research and does work in government relations and environmental policy. IPC advocates for the electronics industry, with regulators around the world. Why Do IPC Standards Matter? Producing safe, reliable, high-performing PCB products requires persistent attention to detail and commitment to quality throughout the production process. Adhering to IPC standards throughout the process can help companies achieve that. Just as the production processes for PCBs take a step-by-step approach, the IPC standards all build upon one another. You can implement an IPC standard for nearly every phase of production. To achieve high-quality, reliable products that meet customer expectations, it’s essential for companies involved in the production of PCBs and the products that use them to commit to quality through the use of IPC standards for printed circuit boards. Complying with IPC standards can help a company improve its processes and products in numerous ways. Here are four of the leading benefits. Adhering to IPC standards throughout the manufacturing process can help companies improve the quality and reliability of their products. Creating products that perform better and last longer will help make a company more competitive and more profitable, as well as improve customer satisfaction. IPC standards can help improve processes and also increase consistency in products. Using IPC standards when inspecting PCBs and other products can ensure consistent quality. Adhering to IPC standards helps improve communication both internally and externally by ensuring everyone is using the same terminology and agrees on expectations. Internally, employees who speak the same language can collaborate and more easily make the changes needed to make improvements. IPC standards also improve communication with customers, supplier vendors, regulators and others. Using the same terminology can prevent miscommunication that can lead to production delays and inconsistencies and, potentially, unhappy customers. The improvements that result from using IPC standards can help reduce costs. Improving quality and minimizing miscommunications diminishes the likelihood of delays and reworks. IPC standards can also allow companies to minimize resource use and increase efficiency. Adhering to internationally recognized standards like those from IPC gives a company instant credibility. Even if someone knows nothing about your business, when they see you follow IPC standards, they can rest assured of your commitment to quality. IPC standards will enhance the quality of your products, improving your reputation. Ultimately, following these standards will help attract customers, open the door to new opportunities and make you more competitive. To help users understand and work with its standards, IPC provides definitions of terms it uses. This common terminology can also help make communication more accurate and efficient across the industry. You can purchase a full list of names and definitions from IPC, but here are a few examples of the kinds of terms you may want to know. IPC defines three classes of electronic products. Class 1 – general electronic products: Class one products are for applications in which the primary requirement is the function of the completed assembly. This class includes most typical everyday products. Class 2 – dedicated service electronic products: Class two products must have high reliability and extended life. Uninterrupted service is preferable, but not critical. The use environment of the product typically wouldn’t cause failures. Class 3 – high-performance electronic products: Class three products must provide continued performance or performance on demand. There can be no equipment downtime, and the end-use environment may be exceptionally harsh. The equipment must function when required. This category includes critical systems such as life support systems. Here are some other terms you may want to know. Acceptance tests: The tests required to determine whether a product is acceptable, as agreed upon by the purchaser and vendor. Assembly: Several parts, subassemblies or combinations thereof joined together. Resist: A coating material used to mask or protect certain areas of a pattern during manufacturing or testing from the action of an etchant, plating, solder, etc. Integrated circuit: A combination of inseparable associated circuit elements formed in place and interconnected on or within a single base material to perform a microcircuit function. Flexural strength: The tensile strength of the outermost fiber of a material that must bend. Critical operation: One procedure of a total process that has a significant impact on the characteristics of the completed product. The electronics industry has changed significantly over the years with the introduction of new technologies, regulations and expectations. As the industry has evolved, IPC standards have grown with it. 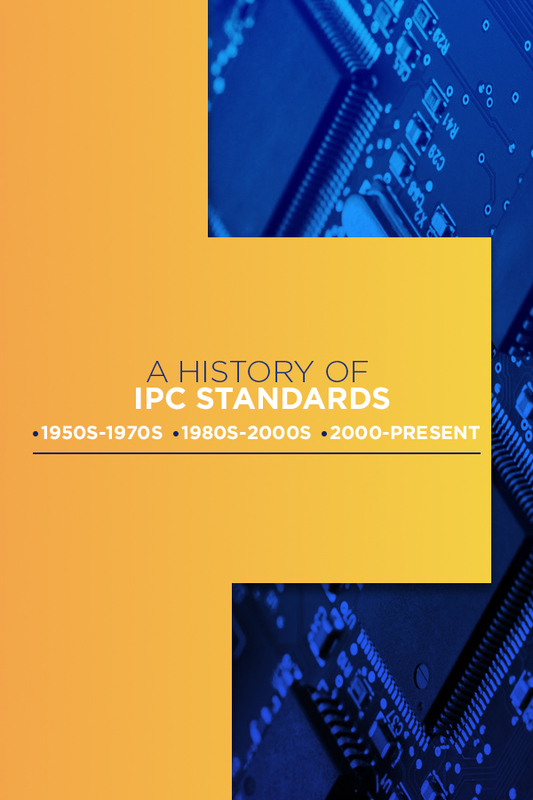 Here’s a brief overview of the history of IPC standards. As mentioned earlier, the Institute for Printed Circuits initially formed in 1957, when six PCB manufacturers came together. The year after its founding, IPC published its book How to Design and Specify Printed Circuits. The book was the organization’s first major publication and sold more than 25,000 copies. In 1964, IPC published the initial version of IPC-A-600, the Acceptability of Printed Boards — the IPC standard for bare PCB acceptability requirements. The standard has undergone seven revisions and updates since then. Today, it remains the leading source for visual support for acceptability requirements for bare boards in the IPC-6010 series. In 1977, IPC changed its name to the Institute for Interconnecting and Packaging Electronic Circuits, in response to the growing number of electronic assembly companies that were becoming involved with the association. The next year, the organization sponsored its first large international event — the Printed Circuit World Convention. Held in London, the event included printed wiring board associations from across the globe. In addition to IPC, then called the Institute for Interconnecting and Packaging Electronic Circuits, sponsors of the conference included the European Institute for Printed Circuits, the Institute of Circuit Technology UK, the Japan Printed Circuit Association and the Printed Circuit Group Institute of Metal Finishing UK. In 1983, IPC published the first version of IPC-A-610, Acceptability of Electronic Assemblies. The standard is the most published and referenced in the organization’s history. 1994 saw the opening of IPC Printed Circuits Expo in Boston, with more than 1,700 people in attendance. The expo featured nearly 100 committee meetings, 60 technical papers and 17 workshops to develop standards. 1994 marked the first time IPC offered its certification and training program for Acceptability of Electronic Assemblies, IPC-A-610B. This program remains one of the organization’s most popular. Today, IPC has issued more than 10,000 certifications of instructors for the program. These certified instructors have trained approximately 125,000 industry professionals. In 1997, IPC first submitted its standards to ANSI for approval. In 1998, the organization officially changed its name to IPC and adopted the tagline Association Connecting Electronics Industries to make the name simpler and reduce confusion surrounding it. In 1999, IPC issued a position statement on the use of lead in PCB manufacturing and electronic assembly. It also started to develop a lead-free roadmap. In 2002, IPC introduced one of its most widely used and best-received standards — IPC-A-620, Requirements and Acceptance for Cable and Wire Harness Assemblies. In 2007, the organization celebrated its 50th anniversary. In 2008, the industry was working through the introduction of lead-free solder. In response to difficulties associated with the transition, IPC worked with the Joint Electron Device Engineering Council and the Electronic Components Association to create the IPC-J-STD-075 standard, the Classification of Non-IC Electronic Components for Assembly Processes. In 2010, IPC issued IPC-1601, Printed Board Handling and Storage Guidelines, which provides advice on protecting PCBs from contamination, moisture uptake, solderability degradation, electrostatic discharge and physical damage. In 2017, IPC celebrated its 60th anniversary. At that time, the organization had more than 4,000 member sites in 79 countries. There are IPC standards for almost every phase of the PCB production process. To give you an idea of what these standards entail, here are a few examples. IPC-2581: IPC-2581 is a generic standard used when sending information between a PCB designer and a manufacturer or assembly company. It provides a standardized format for exchanging design data that helps ensure consistent production results. IPC-2221: IPC-2221 is a generic standard for the design of PCBs. Within the 2220 series, there are also specifications for specific types of PCBs such as rigid, flex and MCM-L. It addresses topics like design layout, parts lists, materials, mechanical and physical properties, electrical properties, thermal management and more. IPC-4101C: IPC-4101C covers requirements for base materials, typically called laminate or prepreg, mostly for use with rigid or multilayer boards. It deals with the materials used, their dimensions and their properties. IPC-6012B: The specification IPC-6012B establishes qualification and performance requirements for the fabrication of rigid PCBs. It offers requirements for the various types of product classes in areas such as structural integrity, solderability and conductor spacing. IPC-A-600F: IPC-A-600F sets acceptance criteria for PCBs. It describes which observable conditions of a board are acceptable and non-conforming — as well as the target conditions — for all parts of the PCB, from gold fingers to copper plating. It is the visual representation of the requirements put forward in other specifications. J-STD-001: IPC J-STD-001 describes the materials, methods and other criteria for creating high-quality soldered interconnections. It focuses on process control and lays out requirements for a range of electronic product types. IPC-A-610: IPC-A-610, Acceptability of Electronic Assemblies, provides criteria for the acceptance of end products. It is the most widely used standard the IPC publishes. IPC-A-620: IPC-A-620 provides criteria for acceptability of cable, wire and harness assemblies and can serve as a stand-alone document for purchasing products. IPC-TM-650: IPC has also published a test methods manual, IPC-TM-650, which provides guidelines for assessing various aspects of PCBs. For example, test method IPC-TM-650 2.6.14.1 describes methods for testing a board’s propensity for surface electrochemical migration. The test measures resistance to the flow of current across a PCB substrate surface. IPC-TM-650-2.3.25.1 describes a method for ionic cleanliness testing of bare printed wire boards, which is important because ionic contamination can cause issues that make a PCB defective. IPC standards are essential for all companies involved in the production of PCBs and electronic products. They help ensure quality products, reduce costs, streamline communication, increase competitiveness and improve credibility. As an IPC member, Millennium Circuits is committed to these standards of quality, as well as to our motto of “redefining customer service.” We aim to provide you with the ideal PCB for your needs every time. Do you have questions about IPC standards or your PCB needs? You can contact us by filling out this form or by calling us at 717-558-5975. You can also fill out a quick quote form here. We look forward to hearing from you.